Danau Diatas or Upper lake and Danau dibawah means Down lake is twin lake in West Sumatra, precisely located at Solok. The route can be reach from Padang – Indarung – Sitinjau Laut – Jalan Padang – Alahan Panjang (Solok). 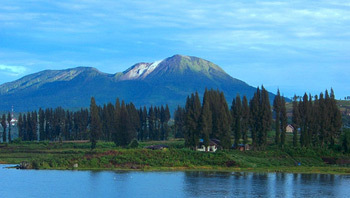 Diatas Lake is settled in the edge of Jalan Padang – Muara Labuh, while Dibawah Lake is located in Bukit Sileh in Lembang Jaya sub-district. West Sumatera province is rich with lakes. There are five lakes here, Maninjau, Batur, Danau Atas, Danau Bawah and Talang Lake. The name of Twin Lakes is taken from the two lakes, Danau Atas and Danau Bawah that located side by side, which is only about 300 meters long. The first area is known as a tourist attraction because it is located on the edge of the highway Padang-Muaralabuh-Kerinci. Danau Diatas has 17.20 square meters, 6.25 km length and 2.75 km wide, the water surface is at an altitude of 1,600 meters above sea level. The lake is quite shallow, the deepest part is only 44 meters. While the water level of Danau dibawah is in an altitude of 1,566 meters above sea level. That is, the surface of the water as high as the base on the water of Danau dibawah. However, the lake has an area of 16.90 square meters, of 5.62 km length and 3.00 km wide is very deep, which is 886 meters.